Fierce punk band X’s current shows, including one at Seattle’s Showbox on Dec. 27, dig deep into the catalog, combining fan favorites with songs never before played live. When X first played shows around Los Angeles, the fierce punk band could never be certain of getting through a complete set. Playing unlicensed venues, with audience fights a regular occurrence, it wasn’t unusual for the police to show up and shut the show down. 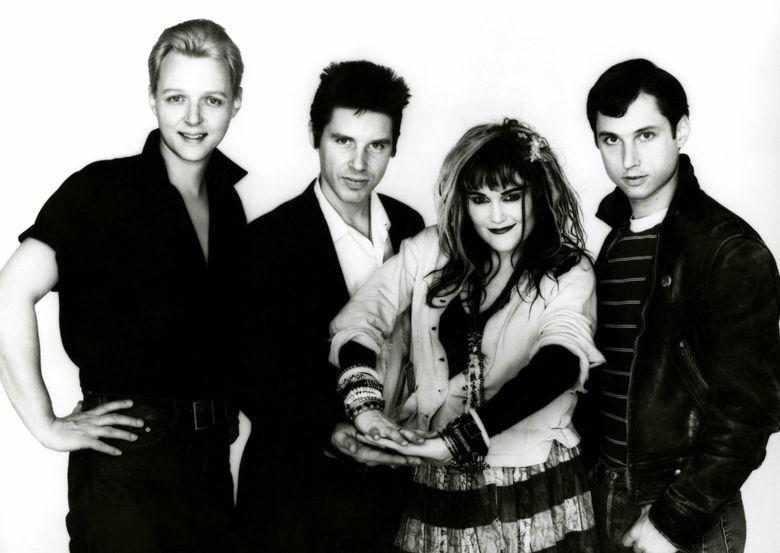 So it was with some bemusement that the band members — vocalist Exene Cervenka, vocalist/bassist John Doe, guitarist Billy Zoom and drummer DJ Bonebrake — found themselves in L.A.’s City Council chambers this past Oct. 11, receiving proclamations designating it “X (the band) Day in the City of Los Angeles.” The honor celebrated both the band’s 40th anniversary and “their contribution to the entertainment music scene in Los Angeles, across the country, and around the world,” in the words of Councilmember Mitch O’Farrell. That wasn’t the only recognition that X, which plays Seattle’s Showbox on Dec. 27, received from the establishment this year. On Aug. 16 the band was honored at a Dodgers baseball game and given specially designed jerseys. Cervenka threw out the ceremonial first pitch while the stadium’s organist played an unlikely cover of the band’s “Blue Spark.” Doe even sang the national anthem. “There’s some saying about buildings and prostitutes; if they last long enough, then they’re venerated,” Doe joked in a phone interview about the band’s newfound respectability. He’s referencing a line from the film “Chinatown,” when John Huston’s scheming character Noah Cross proclaims, “Politicians, ugly buildings and whores all get respectable if they last long enough.” Appropriately, the film is set in Los Angeles — the city where X got its start. X has become a museum piece too, with the Grammy Museum in L.A. hosting the exhibit “X: 40 Years of Punk in Los Angeles,” running through Feb. 25. “It was exciting,” Doe said. “You kind of poo-poo all that stuff until it happens to you. Then you want to thank your grandmother for coming over from the old country and giving birth to your mother!” Among the artifacts is the typewriter Doe and Cervenka used to write the band’s lyrics. “I still use it from time to time,” Doe said. But mostly, the band’s anniversary year has been about celebrating the music; seven albums of songs chronicling the lives of the disaffected and dispossessed, fueled by Cervenka and Doe’s edgy, atonal harmonies and Zoom’s fiery rockabilly licks. While there’s no new album planned (“But you never know”), you can count on X to remain a vibrant live act.